Just like all the other Windows operating systems, Windows 8 has a user friendly interface that makes setting up networks very easy. The Metro Start is the new look for Windows 8 and the benefits for home based businesses and other small businesses are, the option to setup Homegroup. The Home Homegroup feature enables users to connect between all gadgets with Windows 8 like laptops, smart phones and Wi-Fi printers. Windows 8 also has the option of connecting to stand alone servers (media) to share data and to communicate. Here are some useful tips on how to setup Windows 8 networks. Click on the Windows icon for networks given in the tray and you will notice the network list will open up on the right side of your computer screen. To access the network list directly from the Metro Screen, the cursor has to be placed on the tray and then slide the cursor from the bottom right and select the settings option. Then open the metro bar and select the icon which says settings, and the network settings pane will drop down. The very first option given is the Airplane Mode, with a one/off tab. 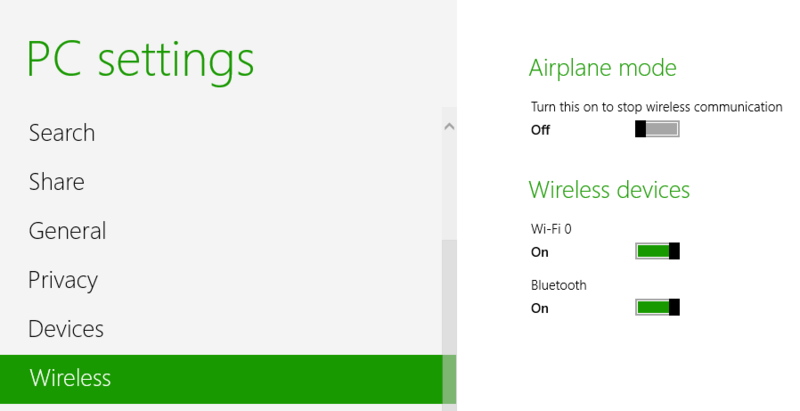 When you enable the Airplane Mode all the wireless communications on the device will be disabled, this is really useful when it comes to carrying tablets and laptops on a plane. Below the Airplane Mode, there is list of mobile broadband (detected) for all 4G & 3G functions. You will also notice a list of Wi-Fi networks that is very similar to the listing in Windows 7, to connect to the network of your choice select the network and click on the connect tab. There is an option to connect automatically if you check the given box. When selecting a network for mobile broadband for laptops and tablets, you will come across Automatically Roam which can be enabled to always stay connected. Every time you connect to a Wi-Fi network for the first time, you will be prompted to enable sharing or communicating for the particular network. This prompt is very similar to the prompts available in Windows 7 & Vista, asking the user what type of network you will be connecting to Home, Work or Public. Based on the option you select Windows 8 will determine whether to enable the sharing mode. Once the sharing mode is enabled, based on what you select, if you choose to share it shows as Private Network, if not then it shows as Public Network. The Windows 8 network list does not have the option or shortcut to access the sharing center and network directly, like in Windows 7 and Vista. To access sharing center right click the networks icon that is given in the system tray, and the control panel is opened. The network & sharing center’s page is more streamlined and less clustered when compared to its previous versions. The users are sure to notice the shortcut for Manage Wireless Networks is not given on the left side of the Windows screen. Windows 8’s Manage Wireless Networks does not support manually prioritizing Wi-Fi networks, but it does so automatically, based on the connectivity behavior of the user.